The 19th. Century saw lots of changes in Colton as with everywhere else in Britain. Education was brought to the masses rather than the select few and a school for all of the children of the parish opened its doors in 1863. The school still exists today. 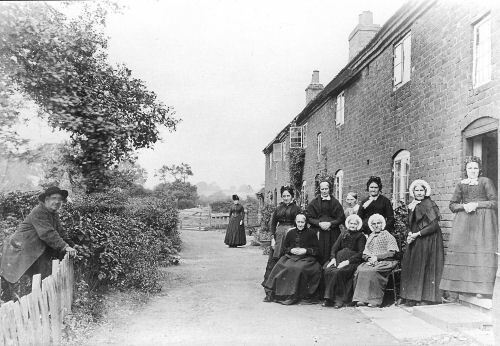 A group of villagers outside the alms houses known as The Barracks. Houses were built for the poor of the Parish in line with national thinking on how the poor of the parishes should be provided for. A row of houses known as the Barracks was built at Stockwell Heath in 1793 for the poor of Colton. Methodism was flourishing in the predominantly working class areas of the towns and cities and eventually it reached Colton. A Methodist chapel was opened in the village and offered an alternative to the local parish church for the residents. Occupations began to change due to the availability of transport and alternative sorts of employment. First the canal came through Colton, then the railway and then finally the car. More and more residents found work further afield than the village. This is all recorded in the Census Records for Colton that date back to the first National Census 0f 1801. Some went to work in industries in Rugeley which by then was a far bigger place than Colton. The local tanning works and brick works supplied a number of jobs for Colton people. The 20th. Century saw the beginning of huge changes in the life of small rural villages and Colton was no exception. The Bellamour Estate was sold off in the early 1920’s and so there was no longer a local Lord of the Manor. The village saw the death of a number of its young men in both world wars. They are commemorated on a cenotaph in the centre of the village. Although the Second World War saw no damage done to the village, incendiary bombs did fall in fields close to the centre of the village It also played host to a group of evacuees from Kent and a camp for English soldiers was set up at Bellamour and American soldiers were billeted at Colton House. We are in touch with some of the evacuees. This picture was sent to us by one of them - Tony Atkinson . 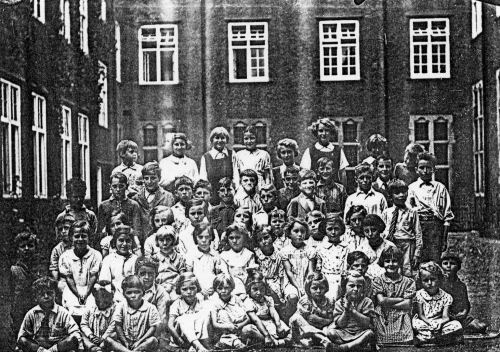 This is the class of evacuees from Westgate on Sea. Were you possibly one of these? In which case please get in touch. The village steadily went down from a regular daily bus service, three shops, butchers and two pubs. Now the only two businesses are the two Pubs. Like so many English villages it has lost almost all its services. However the population has stayed consistently steady all through the centuries and now most villagers are employed much further field with virtually no one now working on the land around Colton. At the end of the 20th. Century it still remains a tight knit community with a tremendous sense of community spirit.